An array of complex issues contributes to this challenge, but we know that any solution starts with parents — children’s first and best teachers. When children have high-quality support to learn and grow early on in their lives, they are much more likely to succeed later in life. 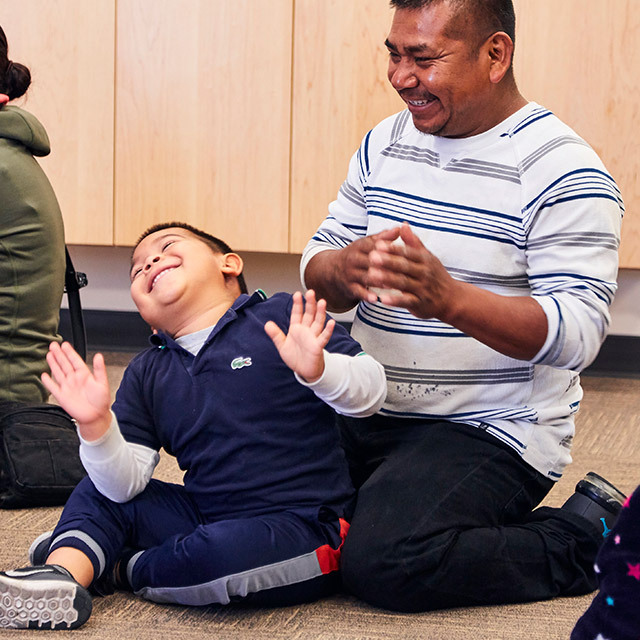 In early 2017, the Early Learning Lab, with major support from the Overdeck Family Foundation, sought out ways to work more closely with parents to ensure that they have the best tools and strategies to help their children learn early. To do so, we identified three barriers that get in the way of better supporting young children and their families. There is often a disconnect between family-serving organizations and parents, so programs don’t engage parents effectively to design services for their needs. Organizations and parents typically don’t have the skills and tools they need to work together to innovate and improve offerings for children. Too often, family-serving organizations in a community compete for scarce funding and don’t collaborate to enhance their programs and services. 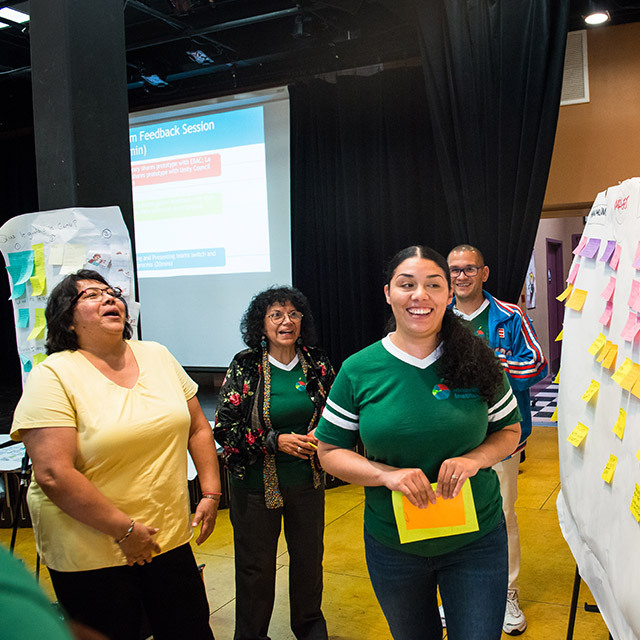 Four participating organizations — César E. Chávez Branch of the Oakland Public Library, La Clínica de La Raza, East Bay Agency for Children, and The Unity Council — assembled teams of two staff members and two parents. These organizations are representative of preschool, library, health, and family resource programs found in most communities. Fruitvale is a vibrant multicultural neighborhood in Oakland, California that blends traditions from all around the world. It’s also a community that faces challenges with immigration, economic inequality, and gentrification. Near the heart of the neighborhood, the four participating organizations are all within walking distance of each other and a variety of other programs and services for local families. The initiative allowed us to learn how co-creation and rapid-cycle learning might develop leadership and innovation capacity, improve services, and strengthen the local early childhood ecosystem. Our approach drew from and built upon the following frameworks. 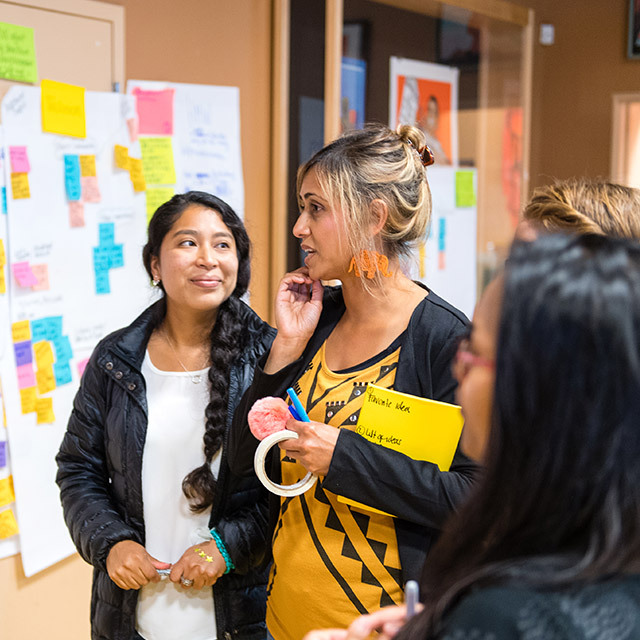 Participants — parents and staff alike — worked collaboratively through the five-step innovation cycle below to co-create new solutions for young children and families. Explore an initial problem and define it from the parents’ point of view through observations, interviews, surveys, and existing research. Incorporate learnings and insights to uncover deeper truths about the community and refine the problem. Creatively and collaboratively brainstorm solutions and pick a few ideas to explore. Develop and implement “prototypes” and make changes to improve them. Use feedback and learnings from the prototypes to develop improved services and programs. Continue using co-creation and rapid-cycle learning to address new challenges as they emerge. La Clínica aimed to address chronic disease and poor nutrition in children, and soon discovered a missing link between the mental health issues of mothers and the food they made for themselves and their children: depression, loneliness, and other mental health issues had a direct impact on their food choices. The team developed an integrated nutrition and mental health curriculum for the community. The prototype was so successful that the team received additional funding to scale the curriculum regionally. 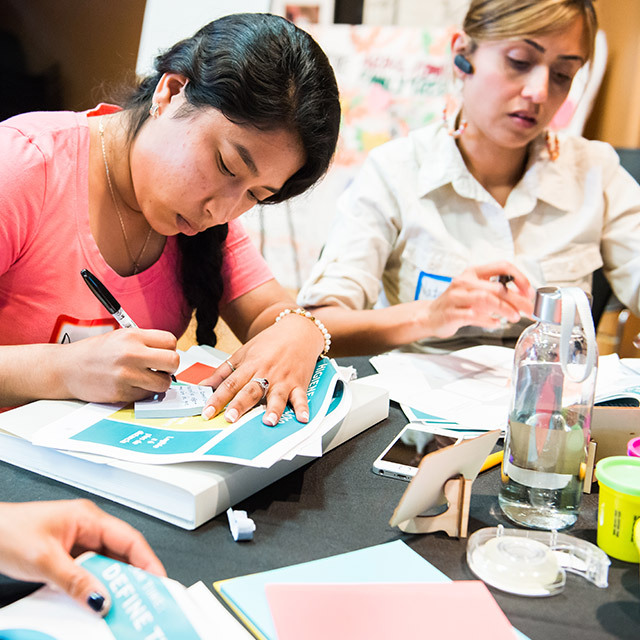 12 community health educators got training to lead workshops. The library team discovered that many families did not know about the library and its resources. In addition, they found out that many families did not have access to subsidized or private preschool. 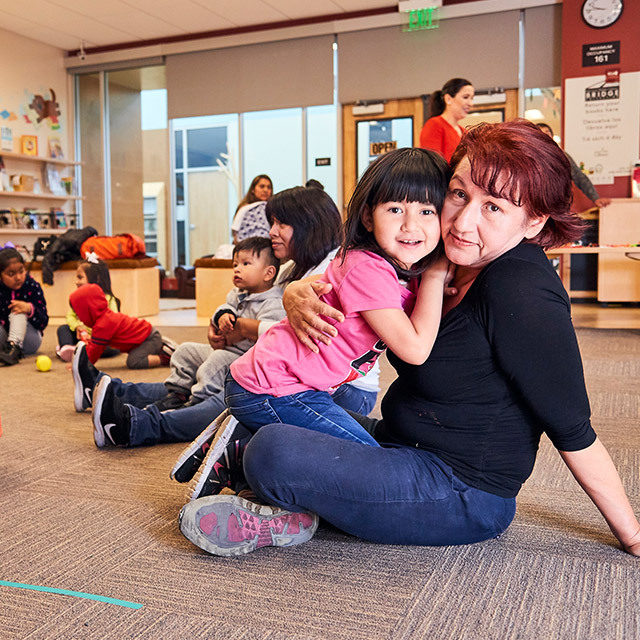 They launched the “Play Café" prototype to welcome families to the library and provide children with a preschool prep program. The Play Café was a hit with children and caregivers and is now a regular offering. 340 children and caregivers participated in the Play Café during the six-week prototype. The team wanted to increase engagement in their programs and learned that they needed to offer more resources that benefited both parents and children. They created two prototypes: a toy lending library for children, and ESL (English as a Second Language) classes for parents. The prototypes were well-received and will continue to be offered at their resource center. 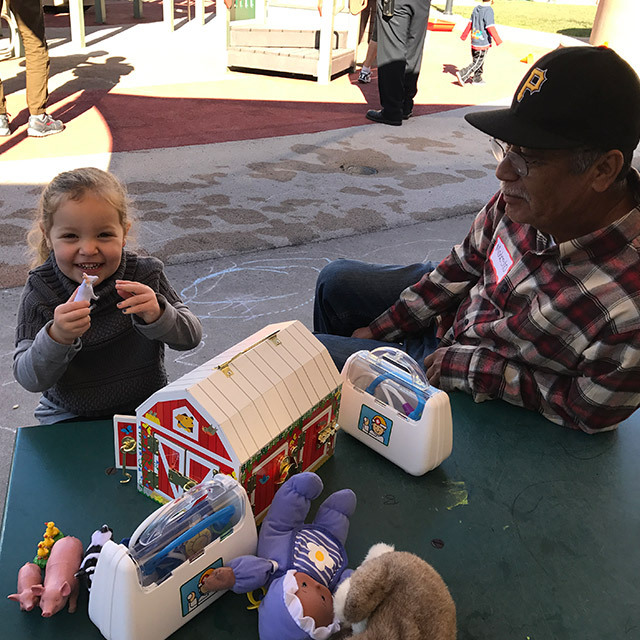 100+ families used the toy lending library. 25 parents attended the ESL classes and 80% reported increased self-confidence. The prototype was popular with families and greatly exceeded attendance expectations. 4x as many fathers attended Day with Daddy events than before. Families reported improved relationships between fathers and their children. Relationships between organizations and parents are more reciprocal, with staff members requesting and responding to parent feedback. 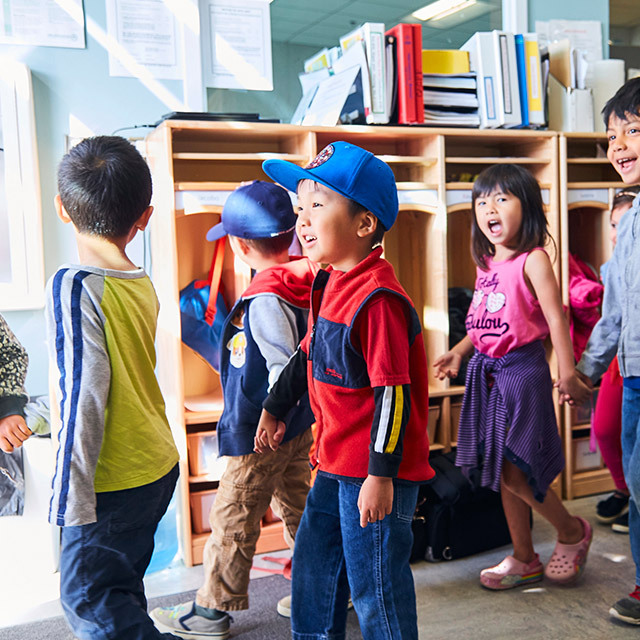 All parents and staff report change in self-perception and now identify themselves as “leaders” and “advocates” for their children and their communities. Organization leaders report significant professional growth in participating staff, who now are leading programs and mentoring colleagues. Organizational leaders recognize the value of co-creation and rapid-cycle learning in their work moving forward. Parent participants reported feeling a growing trust and closer connection to institutions. Organizations developed new relationships with one another and identified new opportunities to work together. Participants are committed to regularly meeting with each other to continue their progress. Organizations are better equipped to use scarce local dollars effectively by working collaboratively rather than competitively. Like the participants, we learned along the way and course-corrected in real time as much as possible. Here are some of the challenges we encountered. 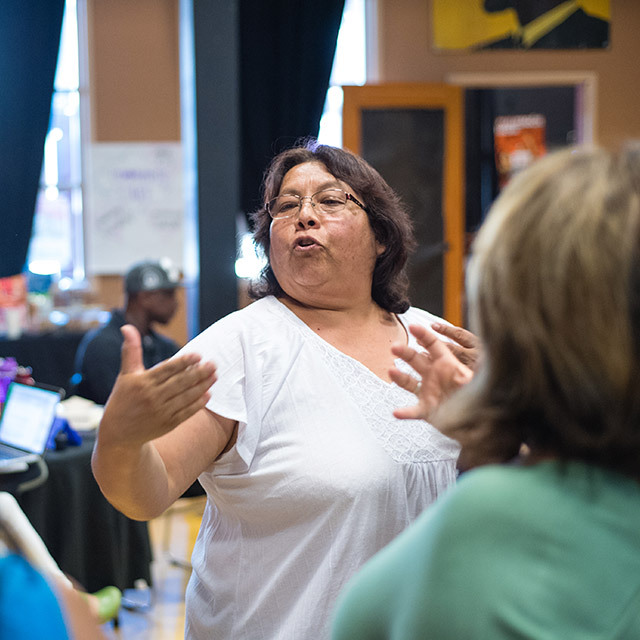 Fear of immigration raids and distrust of public services — along with poverty, gentrification, single parenting, and trauma — are real challenges affecting the Fruitvale community. While we talked openly about these issues and worked to create an environment in which participants felt it was safe to share the real concerns they were facing, there were times when we did not have training — including mental health expertise and training — that would have been helpful to fully support participants. Language, literacy, and technology barriers were also challenges that required ongoing attention. Lack of alignment within participating organizations around their needs and their desires to change — including tensions between staff, parents, and organizational leadership — sometimes slowed the design process. And while participants signed up knowing it would be a rigorous initiative, it was difficult to prepare them for the work ahead, and the teams demonstrated varied levels of commitment. Participants also had different skills and experiences, and this required us to provide varied levels of support. It was difficult to create an appropriate evaluation framework for the institute. Traditional evaluation approaches take a set of inputs and measure their effect. Fundamental to our process was allowing for innovation and iteration of the prototypes, which involves refining inputs along the way. Moreover, good evaluation tools that measure the impact of leadership and ecosystem development are not easy to find. Additionally, most teams and individuals had little to no experience with gathering and using data. Several key ingredients were important in responding to and overcoming the challenges we encountered. We also believe there are additional elements that help make any co-creation and rapid-cycle learning approach between organizations and parents work. Being respectful and responsive to the cultural, linguistic, educational, and socio-economic backgrounds of all participants from the get-go is a must. We created a culturally relevant curriculum, communicated in both English and Spanish, and used a variety of communication channels. Additionally, translators who were also active members of the community helped to bridge any communication barriers. Participants were required to demonstrate a personal willingness to grow, and we explicitly encouraged this mindset across many communication touchpoints. Aligning around specific goals, getting feedback from participants, and benchmarking our collective progress was also integral to creating a shared focus and persevering through growing pains including setbacks, fatigue, and frustration. In addition, communicating with organizational leadership throughout the process could help build greater understanding, buy-in, and growth. 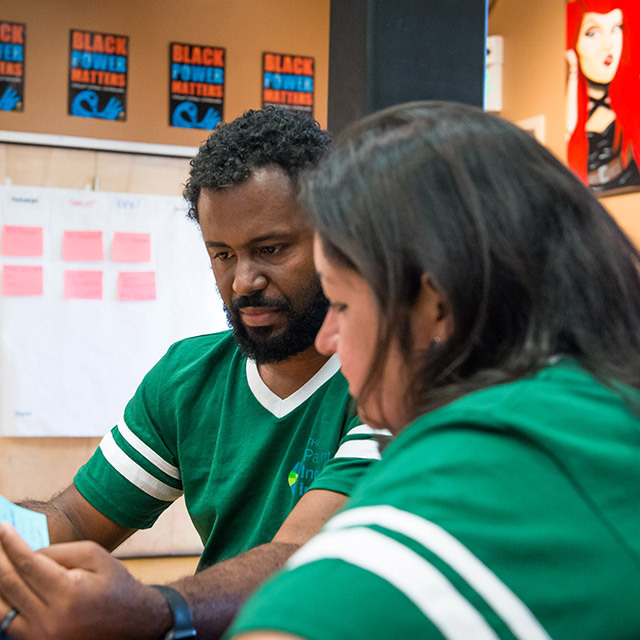 Too often, human-centered design experts come into communities and engage with users at the beginning, but fail to co-create throughout the design process with them. Giving participants equal involvement in every step of the innovation cycle democratizes the design experience and ensures that we’re in touch with the true needs of users. During the institute, parents and staff were involved through each phase of the innovation cycle with equal say and responsibility. 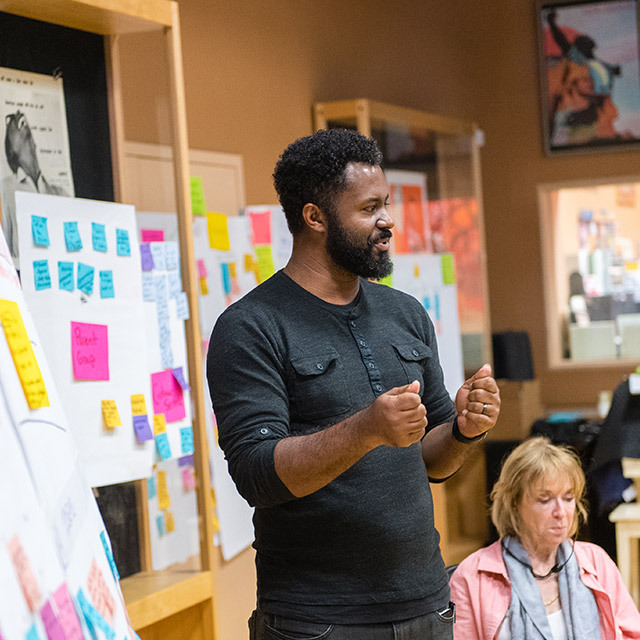 This required us, as program facilitators, to be flexible in the application of human-centered design tools and in creating strategies to ensure that we were leveling the playing field. Putting in place an approach to measurement that is appropriate for a range of impacts — whether it be improved solutions, individual capacity development, or ecosystem strengthening — is tricky and needs to be considered and solved for early on. Early-stage prototype evaluation should be flexible, given the rapid changes in design, and should focus on key markers of impact, with more traditional evaluation happening at later stages. And finally, building the foundational skills of participants in understanding, collecting, and using data from the beginning is critical. Creativity opens the door for free thinking and more innovative solutions. To help with this, we asked for inventive program applications — videos, drawings, and poems — to break through the status quo from the beginning. 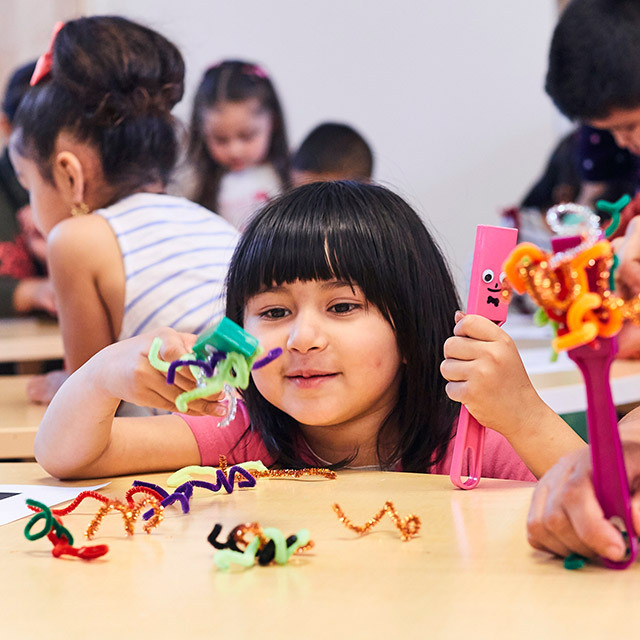 Throughout the workshops, we offered opportunities to be creative and play, providing Play-Doh, markers, and toys that prime creativity, and embedded community building activities. These activities also helped maintain energy levels and motivation. 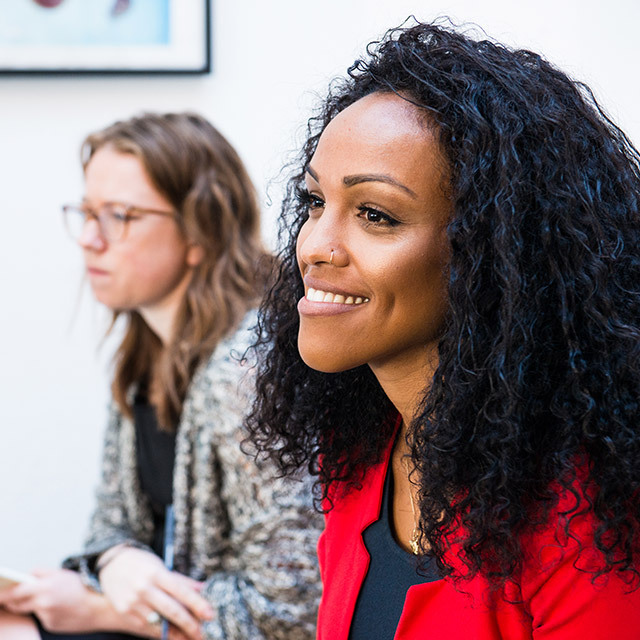 We created distinct leadership roles, including a leader for each team, and required participants to be responsible for different functions at each workshop, including speaking during presentations and delegating tasks to fellow team members. Everyone involved had the space to strengthen their skills in leading, supporting others, and working together as a team. Beginning with the application process, participants were asked to commit to the intensive work the program required. Upon kickoff, everyone signed a community agreement that stipulated individual and collective responsibilities to maintain high standards for everyone's contributions and commitment levels. We were explicit about holding one another accountable for the experience. 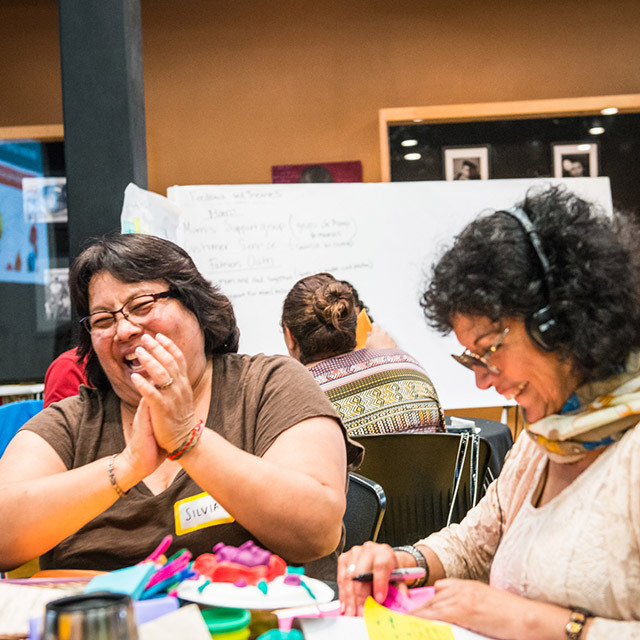 When participants hit roadblocks, we encouraged them to press forward and helped them get to the next step. This created space for them to persist and take ownership. Curating high-quality experiences that communicate respect and appreciation for participants’ inherent values shouldn’t be underestimated. 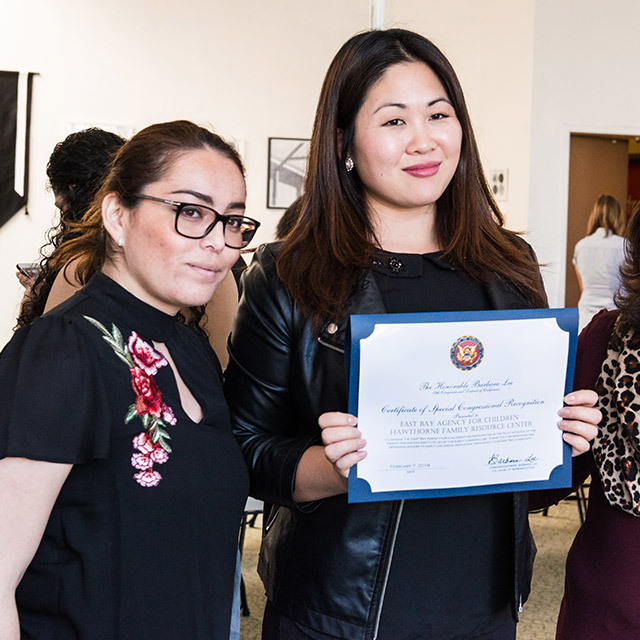 We held our workshops in attractive spaces, provided diverse and delicious food, and awarded participants with a certificate of completion from Congresswoman Barbara Lee’s office. An inspiring environment creates a new context that allows people to want to learn more, depart from the status quo, and imagine the possibilities. 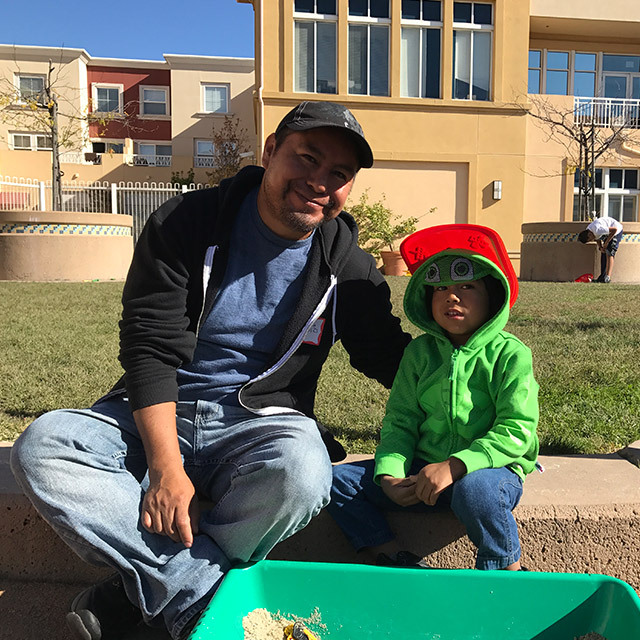 The institute created rich learnings for all involved, and we are proud of the positive impacts the institute and participants helped to achieve for families living in the Fruitvale neighborhood of Oakland. Greater impact for parents and families means doing things differently. We believe that authentic co-creation and the use of rapid-cycle learning are important tools that can unlock innovation and bring better support to children faster. To learn more about the Parent Innovation Institute, contact us at info@earlylearninglab.org. This initiative and case study were made possible by major support from the Overdeck Family Foundation.